Aquamate Refillable Lawn, Garden & RV Water Filter Refillable Lawn, Garden and RV Water Filter provides clean water with no worries. With its patented KDF Copper-Zinc Power Disk , it's your best choice for removing chlorine from your outdoor water supply. The AquaMate lasts for up to 20,000 gallons! However, for best results, replace the filter at least once a year. The Power Disk may be placed in your "Metals" recycling bin. Our AquaMate Water Filter Works Harder and Lasts Longer! Features swivel & brass hose fittings for easy, long-lasting use, so no twisted hoses! At AbundantEarth.com, we have taken it upon ourselves to find the highest quality, longest lasting, recyclable filter we could possibly find. AbundantEarth.com offers the highest quality copper-zinc filters available anywhere. The copper-zinc (KDF) provides an extremely effective filtering media. The KDF process creates an electrochemical reaction between the KDF alloy and the water. This process can reduce up to 98% of chlorine in your water. To recycle your old AbundantEarth.com water filter, the used Power Disk may be placed in your "Metals" recycling bin. Not intended for filling/filtering pond water, well-water, removing rust, or for use on washing machine hook-ups. 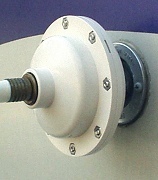 A pressure Regulator must be used for RV use, to insure the housing will not crack. Special: Set of 2 PowerDisk Refills for TurboShower 4 & Aquamate for Chlorine $69.90 $66.00 On Sale! Special: Set of 2 PowerDisk Refills for TurboShower 4 and Aquamate for Chloramines $71.90 $68.00 On Sale!